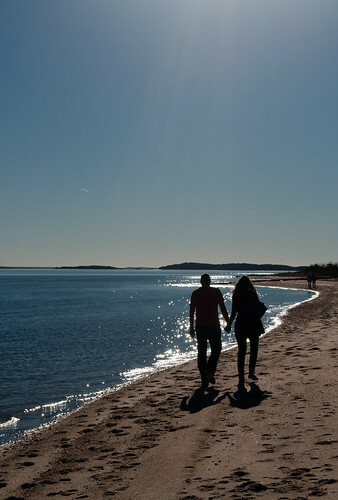 Stretch your legs on one of Shelter Island’s beaches. When it’s hot, the North Fork of Long Island is cooler than the city. There’s less concrete here to absorb the heat, and we’re surrounded by water. Deliciously cooling breezes come off Long Island Sound, Gardiner Bay, and Shelter Island Sound. Guests always ask what is there to do out on the North Fork. One of the things we suggest is a day trip to Shelter Island. Nearby Shelter Island makes a wonderful day trip for guests of our New York Bed and Breakfast. The ferry between Greenport and Shelter Island runs frequently, and bikes are available for rent at Piccozzi’s Garage and Bike Shop, a short walk from the ferry terminal. The island is mostly flat, so cycling is easy. We can help you in creating a picnic for your stop at a beach at the end of Bootleggers Alley. Both Crescent Beach and Silver Beach are great spots for swimming. The water, protected by the North and South Forks of Long Island, is calm and fairly warm. These same sheltered waters are fun to explore in a kayak. Park your bike at Shelter Island Kayak Tours, and let them lead you on a two hour tour. Cycle down to the 2,000-acre Mashomack Preserve on the southeast tip of the island. The Nature Conservancy maintains four trails of varying lengths and difficulty. If you’re on a bike, you may want to avoid the 11 mile trail and stick with the 1.5 mile trail to the shore. Bed will feel so good after a biking around Shelter Island. There are a few nice spots to grab a bite to eat on Shelter Island. Vine Street Café serves wonderful, seasonally-inspired food, but reservations are recommended. Ram’s Head has amazing seafood, such as Lobster Sausage and Green “Gazpacho”. Pat & Steve’s Family Restaurant is the perfect spot to grab a sandwich, and it serves pancakes all day. You’ll be thankful for the generous breakfast Veda provided before your biking excursion, and you’ll be ready to relax once you get back to Arbor View House NY Bed and Breakfast. Even though we are not a Shelter Island Bed and Breakfast but we are not far away. Later on you may even want to take advantage of our spa services, and schedule a massage or aroma-therapy bath for that evening or the following day!